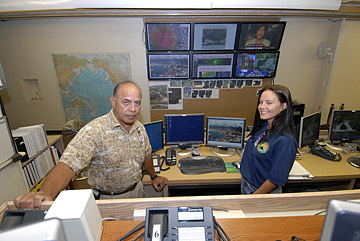 A simulated explosion of a nuclear device by terrorists at Honolulu Harbor will be coordinated from this state civil defense control point in Diamond Head Crater. Vice Director Edward Teixeira, left, and Angela Murphy, warning officer, are in touch with military commanders, state, city and non-governmental officials. For 34 straight hours beginning Aug. 15, state Civil Defense planners will be manning the command center inside Diamond Head Crater in an exercise to cope with the effects of the detonation of a low-yield nuclear bomb planted by terrorists. It's one of 15 scenarios -- wiping out 30 percent of the communications in the downtown area and killing 10,000 people -- involving improvised nuclear devices that the Defense Threat Reduction Agency wants states to prepare for, according to Edward Teixeira, state vice civil defense director. "The state civil defense's job will be to tie into the various, state, city and non-governmental agencies and to coordinate their efforts," Teixeira added. The mock half-kiloton nuclear explosion would take place at the entrance of Honolulu Harbor and would result in immediate casualties of nearly 400 people within 2,000 feet of ground zero, Teixeira said. But because it will take place near government centers of the state Capitol and City Hall, "the electromagnetic pulse could knock down 30 percent of our communications ability," he added. "That means not all of our emergency radios and other communications will be operable and we will have to finds ways to communicate using couriers and other means. It will be a test of the continuity of government services. How will government maintain its services?" Teixeira said the drill is relevant because such communication loss could occur during any natural disaster like a hurricane and "it is something the state must constantly be ready to remedy." "We have to constantly enhance our capabilities," Teixeira added. "Hopefully, we will never see anything like that that, but we have to be prepared." Coordinating the combined state-county-federal operation will be Maj. Gen. Vern Miyagi, who is the mobilization assistant to Adm. William Fallon, head of Pacific Forces in the Pacific. More than 700 state, city and military planners will participate in the mock exercise, dubbed "Exercise A Kele," running Aug. 15-17. Because the state did not want to interfere with the operations of Honolulu Harbor, Bellows Air Force Station will be the stand-in for the harbor. "There's a lot of room there and we will be able to simulate search and rescue, decontamination and other operations there," Teixeira said. The Coast Guard will run its operations from the Clean Island Council on Sand Island The Queen's Medical Center also will be utilized. Teixeira, a retired Army colonel who used to work with Pershing nuclear rockets, said the scenario envisions 10,000 casualties during the first 48 hours not only from the immediate blast but also from the nuclear fallout. Teixeira said the nuclear explosion projected in this month's exercise is 100 times greater than the April 19, 1995, terrorist attack where Timothy McVeigh packed 2 1/2 tons of ammonium nitrate, common farm fertilizer, mixed with fuel oil, into a rental truck and parked it next to the federal building in Oklahoma City. The blast tore down half of the building, killing 169 people. "No question all of urban Honolulu and maybe even as far as Ewa Beach will feel such a blast," Teixeira said. "But in the early moments no one will know whether it was natural or manmade or that it's even nuclear." The blast zone would encompass Sand Island and the Coast Guard Station and the state park located there, he said. "The prevailing trades would then take plume out over the ocean moving parallel down the coast to Ewa." Teixeira said the state's nuclear war plans during the Cold War called for the evacuation of Oahu, turning island streets into one-way traffic patterns with people moving to the Windward side. That same plan also called for sending 100,000 people to the Neighbor Islands by military airlift. He noted that the Department of Homeland Security has devised several scenarios for states to use involving the detonation of 10- and 20-kiloton improvised nuclear devices. In 1945 the U.S. dropped a 15-kiloton bomb on Hiroshima and a larger 22-ton kiloton bomb on Nagasaki. The first A-bomb, "Little Boy," blasted Hiroshima on Aug. 6, 1945, and "Fat Boy" was dropped on Nagasaki three days later. However, for this month's mock exercise, Teixeira said the state chose to test a half-kiloton nuclear device because "it is a more plausible weapon a terrorist group might use." "An improvised nuclear device of that size may be a more real threat," Teixeira said, "and a terrorist group planting it at a harbor is a real possibility." Teixeira said in Hawaiian "a" can mean "hot and fiery," while "kele" can be translated to mean "impurity." There is no Hawaiian word for radiation.